This article is about the original 1984 film. For the 2016 film, see Ghostbusters (2016 film). For other uses, see Ghostbusters (disambiguation). Ghostbusters is a 1984 American fantasy comedy film produced and directed by Ivan Reitman and written by Dan Aykroyd and Harold Ramis. It stars Bill Murray, Aykroyd and Ramis as Peter Venkman, Ray Stantz and Egon Spengler, eccentric parapsychologists who start a ghost-catching business in New York City. Sigourney Weaver and Rick Moranis co-star as their client Dana Barrett and her neighbor Louis Tully. Aykroyd conceived Ghostbusters as a project for himself and fellow Saturday Night Live alumnus John Belushi, with the protagonists traveling through time and space. Aykroyd and Ramis rewrote the script following Belushi's death and after Reitman deemed Aykroyd's initial vision financially impractical. Filming took place from October 1983 to January 1984. Ghostbusters was released in the United States on June 8, 1984. It received positive reviews and grossed $242 million in the United States and more than $295 million worldwide, making it the highest-grossing comedy film of its time. At the 57th Academy Awards, it was nominated for Best Visual Effects and Best Original Song (for the theme song). The American Film Institute ranked Ghostbusters 28th on its 100 Years...100 Laughs list of film comedies. In 2015, the United States Library of Congress selected the film for preservation in the National Film Registry, finding it "culturally, historically, or aesthetically significant". Ghostbusters launched a media franchise, which includes a 1989 sequel, two animated television series (The Real Ghostbusters and Extreme Ghostbusters), video games, and a 2016 reboot. Peter Venkman, Raymond Stantz, and Egon Spengler are scientists investigating the paranormal at Columbia University. After they lose their jobs following a botched ghost investigation at the New York Public Library, they establish Ghostbusters, a paranormal investigation and elimination service. They open their business in a disused firehouse and develop high-tech equipment to capture ghosts. On their first call, at a hotel, Egon warns the group never to cross the energy streams of their proton pack weapons, as this could cause a catastrophic explosion. They capture their first ghost, Slimer, and deposit it in a special containment unit in the firehouse. As paranormal activity increases in New York City, they hire a fourth member, Winston Zeddemore, to cope with demand. The Ghostbusters are retained by cellist Dana Barrett, whose apartment is haunted by a demonic spirit, Zuul, a demigod worshiped as a servant to Gozer the Gozerian, a shape-shifting god of destruction. Venkman competes with Dana's neighbor, accountant Louis Tully, for her affections. As the Ghostbusters investigate, Dana is possessed by Zuul the Gatekeeper, while Louis is possessed by her counterpart, Vinz Clortho the Keymaster. Both demons speak of the coming of "Gozer the Destructor" and the release of the imprisoned ghosts. The Ghostbusters take steps to keep the two apart. Walter Peck, an Environmental Protection Agency lawyer, has the Ghostbusters arrested for operating as unlicensed waste handlers. He orders their ghost containment system deactivated, causing an explosion that releases all the ghosts. The ghosts wreak havoc throughout New York City, allowing Louis/Vinz to escape. Consulting blueprints of Dana's apartment building, the Ghostbusters learn that mad doctor and cult leader Ivo Shandor, declaring humanity too sick to exist after World War I, designed the building as a gateway to summon Gozer and bring about the end of the world. The Ghostbusters are released from custody to combat the supernatural crisis. On the apartment building roof, Zuul and Vinz open the gate between dimensions and transform into supernatural hellhounds. Gozer, in the form of a woman, is attacked by the team. Gozer vanishes, but demands that the Ghostbusters "choose the form of the destructor". Ray inadvertently recalls a beloved corporate mascot from his childhood and Gozer appears as the giant Stay Puft Marshmallow Man that attacks the city. The Ghostbusters cross their proton pack energy streams and fire them at Gozer's portal. The explosion closes the gate, destroys the Marshmallow Man, and banishes Gozer back to its dimension. The Ghostbusters rescue Dana and Louis and are welcomed on the street as heroes. Put [Venkman, Stantz, and Spengler] together, and you have the Scarecrow, the Lion, and the Tin Man. The Ghostbusters concept was inspired by Dan Aykroyd's fascination with the paranormal. His father wrote the book A History of Ghosts. Aykroyd conceived Ghostbusters as a vehicle for himself and his friend and fellow Saturday Night Live alumnus John Belushi. Aykroyd also saw Ghostbusters as an opportunity to modernize the ghost films The Ghost Breakers (1940) and Ghost Chasers (1951). Around 1982, Ivan Reitman, along with Joe Medjuck and Michael C. Gross, had been working with Douglas Adams on an option for a film adaptation of Adams' The Hitchhiker's Guide to the Galaxy. As part of casting considerations for that film, Reitman suggested that Ford Prefect be played by an American actor to help connect the British work to overseas audiences, and recommended Aykroyd or Bill Murray. During this process, Aykroyd presented Reitman with his script, which he felt was a better film, and Medjuck, Gross and himself postponed development of Hitchhiker's Guide to develop this script. According to Reitman, Aykroyd's first treatment was 70 or 80 pages long, and set in the future, largely in space, with numerous creatures. Reitman liked the basic idea but immediately saw the budgetary impracticality of Aykroyd's draft. Reitman also wanted to show how the Ghostbusters started their business. In May 1983, Reitman went to the office of Columbia Pictures president Frank Price to pitch the project. Price green-lit the project for $30 million, with the stipulation that the film had to be released by June 1984. At Reitman's suggestion, Harold Ramis was brought in to improve the script. Aykroyd and Ramis rewrote the screenplay in a Martha's Vineyard basement in the following weeks. To provide storyboards and concept art, associate producer Michael C. Gross hired illustrators including Thom Enriquez, Bernie Wrightson, and Tanino Liberatore. John DeCuir, known for his elaborate sets, was hired as production designer and art director. Ghost puppets were built by Boss Films, which also handled compositing of special effects shots. The "proton packs", the ghost-hunting weapons wielded by the Ghostbusters, were designed by design consultant Stephen Dane, who "went home and got foam pieces and just threw a bunch of stuff together to get the look. It was highly machined but it had to look off-the-shelf and military surplus." The fiberglass props were created by special effects supervisor Chuck Gaspar, based on Dane's design. Gaspar used rubber molds to create identical fiberglass shells, attached them to aluminum back plates and Army surplus All-purpose Lightweight Individual Carrying Equipment frames. Each pack weighed about 30 pounds (14 kg), or nearly 50 pounds (23 kg) with the batteries installed, and strained the actors' backs during the long shoots. Lightweight packs made of foam rubber were used for stunt work. The PKE meter prop was built using an Iona SP-1 handheld shoe polisher as a base, to which lights and electronics were affixed. The Ghostbusters' vehicle, the Ectomobile, was in the first draft of Aykroyd's script, and visualized through concept drawings by John Daveikis. Early versions were jet black, and had more fantastic features, such as the ability to dematerialize and evade police pursuit. The vehicle was a modified 1959 Cadillac Miller-Meteor with an aftermarket ambulance conversion. Dane created its high-tech roof array in Hollywood with objects including a directional antenna, an air-conditioning unit, storage boxes and a radome. Because of its size, the roof rack was shipped to Manhattan via airplane, while the car was transported to the East Coast via train. Sound designer Richard Beggs created the distinctive siren from a recording of a leopard snarl, cut and played backward. Aykroyd and Ramis initially wrote the role of Louis Tully for John Candy and Aykroyd's sidekick for Belushi. However, Belushi died on March 5, 1982, so Aykroyd considered rewriting the script for Richard Pryor, until he chose Murray instead. Candy did not understand the role, so he passed it on. Rick Moranis loved the script and signed on for the role of Tully. Louis Tully was conceived as a conservative man in a business suit, but Moranis portrayed Louis as a geek instead. Gozer was originally to appear in the form of Ivo Shandor, a slender, unremarkable man in a suit played by Paul Reubens. However, the role went to Yugoslav model Slavitza Jovan. An obituary from the February-March 2000 issue of the Science Fiction Chronicle states that the demonic voice of Gozer was provided by Paddi Edwards, since Jovan's accent needed a dub.Sandra Bernhard was considered for the secretary Janine Melnitz, but the role went to Annie Potts. According to Hudson, an earlier version of the script had his character, Winston, in a larger role with an elaborate backstory as an Air Force demolitions expert. Excited by the part, he agreed to the job for half his usual salary. The night before shooting began, he was given a new script with a greatly reduced role; Reitman told him the studio had wanted to expand Murray's role. In a 2015 article for Entertainment Weekly, Hudson wrote: "I love the character and he's got some great lines, but I felt the guy was just kind of there. I love the movie, I love the guys. I'm very thankful to Ivan for casting me. I'm very thankful that fans appreciate the Winston character. But it's always been very frustrating—kind of a love/hate thing, I guess." They had one night to dress the street. When people went home early in the evening everything was normal, and when the little old ladies came out to walk their dogs in the morning, the whole street had erupted. Apparently people complained to the New York Police Department and their switchboard lit up. I think it was a love letter to New York and New Yorkers. Central Park West, and Tavern on the Green, and the horses in the park, and the doorman saying, "Someone brought a cougar to a party" – that's so New York. When we come down covered with marshmallow, and there are these crowds of New Yorkers of all types and descriptions cheering for us as a New York–it was one of the most moving things I can remember. Interior scenes were shot at Burbank Studios in Los Angeles. The interiors of the Los Angeles Central Library stood in for the basement of its New York counterpart in the film's opening. Downtown Los Angeles' decommissioned Fire Station No. 23 was chosen for the interior of the Ghostbusters' headquarters because its interiors seemed visually consistent with the exterior of the Tribeca firehouse. The Millennium Biltmore Hotel stood in for the scenes set at New York's Waldorf-Astoria. The climactic earthquake scene was shot in Manhattan, enhanced with supplemental work in Los Angeles. While the shot of the Ghostbusters and other New Yorkers falling down was filmed on location, the shots of the street cracking were achieved with hydraulics used on a Los Angeles sound stage. The "marshmallow" that rains down on the crowd after Gozer is destroyed was shaving cream. Nothing like the shot had been done before, and William Atherton (Peck) insisted on a trial run before filming. After a test with 75 pounds (34 kg) of shaving cream knocked a stuntman flat, only 35 pounds (16 kg) were used for the final shot. Richard Edlund left Industrial Light & Magic to open his own business and accepted the task of creating visual effects for Ghostbusters using techniques including miniatures, puppetry, stop-motion, rotoscoping, and cell animation. He split his working schedule since he had also been hired to create visual effects for MGM's science-fiction film 2010. The green "Onionhead ghost", later named Slimer, was performed by Mark Wilson, who wore a foam rubber suit reinforced with spandex. Mechanical designers used cables to operate his face. His sequences were filmed at a rate of eight frames per second, while the Stay Puft Marshmallow Man was filmed at a rate of 72 frames per second. Reitman said there are 650 special effects shots in the entire film. The filming was completed in 62 days, by January 1984. In March 1984, the film was screened for test audiences with unfinished effects shots to determine if the comedy worked. A viral campaign was initiated by the studio featuring the "No ghosts" logo, which created popularity even though the people were yet unaware of the film's title or its stars. Ghostbusters was released on June 8, 1984, in 1,339 theaters. It grossed $13.6 million on its opening weekend and $23 million in its first week, setting studio records at the time. It surpassed Tootsie's record as Columbia's best opening week. The film was number one at the box office for five consecutive weeks, grossing $99.8 million. After seven weeks, it was dropped to the number-two position by Prince's film Purple Rain, at which point it had grossed $142.6 million, second only to Indiana Jones and the Temple of Doom as the year's top grosser. Ghostbusters regained the top spot the next week, and again six weeks later. During its last week of playing at the theaters, December 28, 1984-January 3, 1985, it earned another $699,366, placing it No. 15 at the US box office. By the year's end, Ghostbusters had grossed $221 million, making it the highest-grossing film of the year and the highest-grossing comedy of its time. It went on to gross $229.2 million but was surpassed by Beverly Hills Cop as the highest-grossing 1984 film and the highest-grossing comedy. Ghostbusters was re-released in August 1985. During the first week of its reissue, August 23-29, 1985, it grossed $3,055,491, making it No. 8 at the US box office. The 1985 re-release raised Ghostbusters' U.S. gross to $238.6 million ($556 million in today's dollars), surpassing Beverly Hills Cop and making it the highest grossing comedy film of its time. Ghostbusters sold over 68 million tickets in the U.S. in its initial theatrical run. It was re-released for its 30th anniversary in 2014 and grossed a further $3.5 million, taking its U.S. gross to $242.2 million. Adjusted for inflation, these figures put it within the top 40 highest-grossing films of all time by 2019. The main cast members each received percentages of the gross profits or net participation of the film. You never expect that big a hit. But there was a great sense that we were doing something special right from the beginning. Ghostbusters received positive reviews. Roger Ebert in the Chicago Sun-Times wrote that it was "an exception to the general rule that big special effects can wreck a comedy", and gave it three-and-a-half stars out of four. Ebert praised the special effects and their natural inclusion into the story, saying that they are placed at the service of the intelligent characters. He also cited Ghostbusters as a rare mainstream film with many quotable lines. Newsweek's David Ansen enjoyed the film, describing it as a teamwork project where everyone works "toward the same goal of relaxed insanity"; he called the film a "wonderful summer nonsense". Time's Richard Schickel also praised the humor, which he felt was successful despite the abundance of special effects and dark themes such as Armageddon. He praised the three lead actors: he complimented Aykroyd and Ramis, who also gave room to their co-star Bill Murray. Schickel considered Murray's character Peter Venkman a "once-in-a-lifetime opportunity to develop fully his patented comic character". Deseret News' Christopher Hicks praised Reitman's improved directing skills, as well as the crew for avoiding vulgarity found in their previous films, Caddyshack and Stripes. He found that they instead reached for more creative humor and genuine thrills. Hicks singled out Murray who, according to him, "has never been better than he is here". Hicks noted that Murray, Ramis and Aykroyd "wanted to be like the Marx brothers of the 80s". He complained at the finale, claiming it to have lost its sense of fun and to be "overblown", but found that the film compensates this since it "has ghosts like you've never seen". Pauline Kael had problems with the chemistry among the three lead actors. She praised Murray, but felt that other actors did not have much material to contribute to the story; she concluded, "Murray's lines fall on dead air." Contrary to Ebert's and Schickel's review, Janet Maslin in The New York Times was of the opinion that special effects overshadowed the humor. She liked the idea of Murray in an Exorcist-like horror parody, but thought the concept was not fully developed. She deemed the jokes, the characters and the story weak. For Maslin, Ghostbusters worked during the small ghost-catching scenes, but went out of hand during the doomsday scenario finale. The review-aggregation website Rotten Tomatoes gives a score of 97 percent based on 71 reviews from critics, and a weighted average of 8.14 out of 10. The website's critical consensus describes the film as "an infectiously fun blend of special effects and comedy, with Bill Murray's hilarious deadpan performance leading a cast of great comic turns". At Metacritic, the film has a score of 71 out of 100 based on eight reviews, indicating "generally favorable reviews". Modern review websites Filmsite and Film.com included it among the best films of 1984. Writing for the film's 30th anniversary, Time Out's Tom Huddleston awarded Ghostbusters five out of five, praising Reitman's direction, Murray's performance, the script, the special effects, and the soundtrack, which he said felt fresh. Huddleston described the film as a "cavalcade of pure joy". 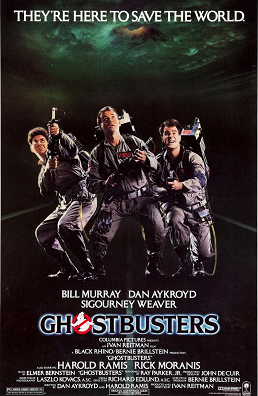 Ghostbusters was nominated at the 57th Academy Awards for Best Original Song (Ray Parker Jr., "Ghostbusters") and Best Visual Effects (John Bruno, Richard Edlund, Chuck Gaspar and Mark Vargo). The film was nominated for three Golden Globes: Best Motion Picture – Musical or Comedy, Best Actor – Motion Picture Musical or Comedy (Bill Murray) and Best Original Song (Ray Parker Jr.). It went on to win the 1985 BAFTA for best original song (Ray Parker Jr.), while it was also nominated in the best visual effects category. It also won the Saturn Award for Best Fantasy Film. In 2009, National Review ranked Ghostbusters No. 10 on its "25 Best Conservative Movies of the Last 25 Years" list, on the grounds that the Environmental Protection Agency is portrayed as the villain and "the solution to a public menace comes from the private sector". The VHS version of Ghostbusters sold over 400,000 cassettes in 1985. Its total revenue of $32 million made it among the five bestselling film cassettes of the year. In 1989, The Criterion Collection released a LaserDisc version, in a one-disc CLV version and a two-disc special edition CAV version. The latter included deleted scenes, a split-screen demonstration of the film's effects, the screenplay, and other special features. Reitman was unhappy with the LaserDisc release of the film, explaining that "it pumped up the light level so much you saw all the matte lines. I was embarrassed about it all these years." The DVD version of the film was released on June 29, 1999. In 2008, Ghostbusters became the first film released on a USB flash drive. It was released on Blu-ray on June 16, 2009, to coincide with its 25th anniversary. A second Blu-ray version, released on May 14, 2013, was marketed as "Mastered in 4K", while a true 4K Blu-ray was released on June 7, 2016. Sony Pictures rereleased the film in nearly 500 theaters in the United States on October 13, 2011, and the following two Thursdays before Halloween of that year. Sony reissued a remaster in 4K version for its 30th anniversary on August 29, 2014. Originally a one-week re-release for the U.S. Labor Day, it ran for three weeks ending on September 18. The theme song, "Ghostbusters", was written and performed by Ray Parker Jr. It was at number one for three weeks on the Billboard Hot 100 chart, and stayed on the chart for 21 weeks. According to Bruce A. Austin, the theme "purportedly added $20 million to the box office take of the film". The music video, directed by Reitman, features cameos by celebrities including Chevy Chase, Irene Cara, John Candy, Melissa Gilbert, Ollie E. Brown, Jeffrey Tambor, George Wendt, Al Franken, Danny DeVito, Carly Simon, Peter Falk, and Teri Garr. It concludes with the stars of the film dancing and singing in Ghostbuster costume behind Parker in Times Square. In 1984, songwriter Huey Lewis sued Ray Parker Jr. for plagiarism, claiming that Parker had copied the melody from his 1984 song "I Want a New Drug". Lewis had been approached to compose the theme for the film, but declined due to his work on the soundtrack for Back to the Future. The case was settled out of court. The Ghostbusters score, composed by Elmer Bernstein, uses ondes Martenot (a staple of Bernstein's 1980s work) and the Yamaha DX7 synthesizer. Peter Bernstein, David Spear and Patrick Russ contributed orchestration. The score was released in 2006 as Ghostbusters: Original Motion Picture Score by Varèse Sarabande. It contains 39 tracks by Bernstein, including several cues that were replaced in whole or in part by songs, and four pieces recorded for the album ("Ghostbusters Theme," "Dana's Theme," and the previously unreleased "Magic" and "Zuul"). Bernstein understood the decision to supplant his opening and some of the closing credit music with the Ray Parker Jr. song, but disapproved of other pieces being replaced, particularly "Ghosts! ", which was written for the scene in which the ghosts are released. Reviewers at AllMusic awarded both the Original Soundtrack Album and the Original Motion Picture Score 4 out of 5 stars. Evan Cater describes the Original Soundtrack Album as "a very disjointed, schizophrenic listen" that "does very little to conjure memories of the film". However, he cited the title track, Mick Smiley's "Magic", and the two inclusions from Elmer Bernstein's score as exceptions. Jason Ankeny described the Original Motion Picture Score as "epic in both sound and scale", writing that it "ranks among Bernstein's most dazzling and entertaining efforts, evoking the widescreen wonder of its source material ... his melodies beautifully complement the wit and creativity of the onscreen narrative". Ghostbusters was reportedly Columbia Pictures' most lucrative hit: by October 1984, it already spanned dozens of advertisements. Its title entered the urban dictionary, since it was applied to the national budget ("budgetbusters"), agriculture ("cropbusters"), B-52s ("nukebusters") or sanitation ("litterbusters"). After the success of the first film and the 1986 animated series The Real Ghostbusters, Columbia Pictures managed to persuade the producers to make a sequel. The second film, Ghostbusters II, was released in 1989. On February 24, 2014, Ramis died, causing Sony Pictures to re-evaluate the script that they were writing for Ghostbusters III. Sony was planning on starting production in New York early in 2015, but Reitman decided to pull out of directing the film in light of Ramis's death. Reitman, however, was to help to find a new director. It was revealed on March 20, 2014, that Phil Lord and Chris Miller were in talks to direct the film, but by April 8, 2014, the duo had decided to pass on the project. On May 30, 2014, The Wrap reported that Ruben Fleischer is being considered to direct the third film. Weaver told Vanity Fair that her character's son, Oscar, would be a Ghostbuster in the film. On August 2, 2014, The Hollywood Reporter revealed that the studio wanted Paul Feig to direct the film and wanted to make it an all-female Ghostbusters team. On September 17, 2014, Aykroyd told The Hollywood Reporter that he wanted to do a Ghostbusters-style universe similar to Marvel's own universe. On October 8, 2014, The Hollywood Reporter announced that screenwriter Katie Dippold and director Paul Feig would write the script. On December 10, 2014, both Rebel Wilson and Jennifer Lawrence revealed they were approached for a role in the reboot, while Emma Stone, Melissa McCarthy, Amy Schumer and Lizzy Caplan expressed interest in appearing. On December 15, 2014, leaked emails from Sony revealed Channing Tatum and Chris Pratt's ultimate plan to team up for a different Ghostbusters film, with Tatum comparing it to Batman Begins. In January 2015, the main cast members for the all-female lead film, were announced as McCarthy, Kristen Wiig, Leslie Jones and Kate McKinnon. The global release dates for the reboot, titled Ghostbusters, were across July 2016. In a February 2015 interview on Ron Bennington's radio show Unmasked, Aykroyd stated he would still like to see his idea for a sequel made. The following month, Deadline wrote that an all-male lead Ghostbusters film was in the works from Sony's Ghost Corps label, with Channing Tatum set to star, Reid Carolin and Peter Kiernan producing, Drew Pearce writing and Anthony and Joe Russo directing. In 2016, the project was confirmed to be cancelled, with the Russo brothers no longer attached. Ivan Reitman later revealed that the project was never in serious development. Entertainment Weekly reported in January 2019 that a new Ghostbusters film is in development, to be helmed by Jason Reitman, Ivan's son. The film is to be set in the same universe as the first two Ghostbusters films, with Reitman directing and writing the film alongside Gil Kenan, and aiming for a 2020 release. In 2017, Royal Ontario Museum paleontologists Victoria Arbour and David Evans were studying a fossil of a newly discovered ankylosaur species, and decided that its head resembled that of Zuul from Ghostbusters. Accordingly, they named the species Zuul crurivastator. ^ a b c d e f g h i j k l m n o "Ghostbusters (1984)–AFI Catalog of Feature Films". American Film Institute. Retrieved January 12, 2019. ^ a b c d e "Ghostbusters". Box Office Mojo. June 8, 1984. Retrieved September 19, 2014. ^ a b Blume, Lesley M. M. (June 4, 2014). "The Making of Ghostbusters: How Dan Aykroyd, Harold Ramis, and "The Murricane" Built "The Perfect Comedy"". Vanity Fair. Retrieved December 20, 2018. ^ a b c d e f Galloway, Stephen (July 15, 2016). "The Making of a Comedy Classic: Director Ivan Reitman Spills the Secrets Behind the Original 'Ghostbusters'". The Hollywood Reporter. Retrieved December 18, 2018. ^ Shay 1985, p. 7. ^ a b c Matloff, Jason (February 24, 2014). "An Oral History of Ghostbusters". Esquire. Retrieved 12 January 2019. ^ Reynolds, Andrew (March 9, 2017). "Star Wars with Jokes: The Hitchhiker's Guide to the Galaxy Movie". The Doctor Who Companion. Retrieved February 11, 2019. ^ a b Reitman, Ivan (2005). Ghostbusters DVD commentary (DVD). Columbia TriStar. ^ Wallace 2015, p. 21. ^ Wallace 2015, p. 70–71. ^ Wallace 2015, p. 55–56. ^ Wallace 2015, p. 59. ^ Wallace 2015, p. 41–42. ^ "Proton Charging interview with Gozer actress, Slavitza Jovan". Archived from the original on September 27, 2007. Retrieved April 1, 2007. ^ a b "'Ghostbusters' Turns 30! Here's How Bill Murray, Dan Aykroyd, Harold Ramis Ended Up Making Timeless Comedy". HuffPost. September 3, 2014. Retrieved January 13, 2019. ^ "The painful what-if that haunts 'Ghostbuster' Ernie Hudson". Entertainment Weekly. November 5, 2014. Retrieved March 7, 2016. ^ Wallace 2015, p. 31–32, 38–39, 48. ^ Gaines, Steven (November 7, 2005). One Apartment, 75 Years". New York. Retrieved April 3, 2007. ^ a b Wallace 2015, p. 39. ^ Wallace 2015, p. 47–48. ^ Wallace 2015, p. 38–39. ^ Hutchinson, Sean (July 14, 2016). "20 Things You Might Not Know About Ghostbusters". Mental Floss. Retrieved September 20, 2018. ^ "Ghostbusters". Box Office Mojo. Retrieved December 4, 2008. ^ Rich, Joshua (June 9, 2000). "High Spirits". Entertainment Weekly. Retrieved April 14, 2009. ^ "'Ghostbusters' Grosses Near 'Indiana Jones'". The New York Times. AP. July 12, 1984. Retrieved December 4, 2008. ^ "'Purple Rain' Ousts 'Ghostbusters' as No. 1". The New York Times. UPI. August 1, 1984. Retrieved December 4, 2008. ^ "'Ghostbusters' Regains Top Spot at Box Office". The New York Times. UPI. August 8, 1984. Retrieved December 4, 2008. ^ "Weekly Box Office, December 28-January 3, 1985". Box Office Mojo. Retrieved January 21, 2019. ^ "'Ghostbusters' Tops Comedies". Variety. January 16, 1985. p. 16. ^ "1984 Domestic Grosses". Box Office Mojo. Retrieved December 4, 2008. ^ "Weekly Box Office, August 23-29, 1985". Box Office Mojo. Retrieved January 21, 2019. ^ "Release History for Ghostbusters". Box Office Mojo. Retrieved December 4, 2008. ^ Browne & Browne 2001, p. 320. ^ "Domestic grosses Adjusted for ticket price inflation". Box Office Mojo. Retrieved May 29, 2018. ^ Ebert, Roger (January 1, 1984). "Ghostbusters". Chicago Sun-Times. Retrieved December 4, 2008. ^ Ansen, David (June 11, 1984). "Got a Demon in Your Icebox?". Newsweek. ^ Hicks, Christopher (October 8, 1984). "Ghostbusters a funny step forward for crazy trio". Deseret News. Salt Lake City, Utah. Retrieved January 21, 2019. ^ Kael, Pauline (June 25, 1984). "The Pop Junkpile". The New Yorker. ^ Maslin, Janet (June 8, 1984). "Ghostbusters". The New York Times. Retrieved December 4, 2008. ^ "Ghostbusters". Rotten Tomatoes. Retrieved January 15, 2019. ^ "Ghostbusters Reviews". Metacritic. CBS Interactive. Retrieved September 7, 2014. ^ "The Greatest Films of 1984". AMC Filmsite.org. Retrieved May 21, 2010. ^ Johanson, MaryAnn (July 13, 2007). "The 10 Best Movies of 1984". Film.com. Archived from the original on September 4, 2014. Retrieved September 3, 2014. ^ Huddleston, Tom (October 27, 2014). "Ghostbusters". Time Out. Retrieved December 20, 2018. ^ "The 57th Academy Awards in 1985". Academy Awards. Retrieved December 17, 2018. ^ "Winners and Nominees in 1985". Golden Globes. Retrieved December 17, 2018. ^ "Film in 1985". BAFTA. Retrieved December 17, 2018. ^ "1984 FILM AWARDS for Best Fantasy Film Release: Winner Ghostbusters". Saturn Awards. Retrieved December 20, 2018. ^ "AFI's 100 Years...100 Laughs" (PDF). American Film Institute. 2002. Retrieved January 15, 2019. ^ Cammorata, Nicole; Duffy, James. "Bravo's 100 Funniest Films". The Boston Globe. Archived from the original on October 18, 2007. Retrieved December 11, 2006. ^ "The Comedy 25: The Funniest Movies of the Past 25 Years". Entertainment Weekly. August 27, 2008. Retrieved August 27, 2008. ^ "100 Best Essential Comedy Movies". Rotten Tomatoes. Retrieved January 15, 2019. ^ "25 Best Comedies". IGN. November 28, 2018. Retrieved January 15, 2019. ^ "Readers' Poll: The 25 Greatest Movies of the 1980s". Rolling Stone. Retrieved January 15, 2019. ^ "The 50 Best 80s Movies". Complex. February 16, 2018. Retrieved January 15, 2019. ^ "The 100 Greatest Movies". Empire. March 20, 2018. Retrieved January 22, 2019. ^ "The Best Conservative Movies". National Review. February 23, 2009. ^ Harmetz, Aljean (February 2, 1986). "Next video-cassette boom may be mass market sales". The Gainesville Sun. Gainesville, Florida. Retrieved December 23, 2017. ^ "The Criterion Collection: Ghostbusters". voyagerco.com. Voyager Media Store. Archived from the original on February 13, 1997. Retrieved April 30, 2012. ^ a b Giltz, Michael (June 18, 1999). "Ghostbusters gets a face-lift on DVD". Entertainment Weekly. Retrieved April 14, 2009. ^ "Ghostbusters is first film to be released on USB stick, News". Custom PC. September 3, 2008. Archived from the original on February 28, 2009. Retrieved February 13, 2009. ^ Miska, Brad (May 4, 2013). "Rejoice! 'Ghostbusters' 4K Blu-ray Release A Brand New Transfer!!!". Bloody Disgusting. Retrieved October 16, 2014. ^ Miska, Brad (April 4, 2016). "'Ghostbusters' Films Get 4K Ultra HD Upgrades - Bloody Disgusting". Bloody Disgusting. Retrieved June 14, 2018. ^ Labrecque, Jeff (September 22, 2011). "'Ghostbusters' back in theaters for Halloween". Entertainment Weekly. Beginning on Thursday, Oct. 13 — and continuing on the next two Thursdays before Halloween — Ghostbusters will play one showtime each day in approximately 500 theaters across the U.S.
^ Seikaly, Andrea (June 5, 2014). "'Ghostbusters' to Celebrate 30th Anniversary With Theatrical Re-Release". Variety. Retrieved August 11, 2014. ^ "Ghostbusters". Billboard. Retrieved January 14, 2019. ^ Austin 1989, p. 78. ^ Lau, Melody (July 14, 2016). "15 Things You Might Not Know about the Ghostbusters Theme Song". CBC Music. Retrieved 20 December 2018. ^ "'Ghostbusters' phenomenon continues". The Day. Los Angeles. October 16, 1984. Retrieved January 21, 2019. ^ Park, Jeannie (December 25, 1988). "Slime? Don't Worry! The Ghostbusters Are Back". New York Times. Retrieved December 17, 2018. ^ Caro, Mark (September 5, 2008). "Harold Ramis confirms 'Ghostbusters III'". Pop Machine (column). Chicago Tribune. Retrieved April 29, 2012. ^ Fierman, Dan (July 18, 2010). "Bill Murray Is Ready To See You Now". GQ. Retrieved April 29, 2012. Harold Ramis said, Oh, I've got these guys, they write on The Office, and they're really funny. They're going to write the next Ghostbusters. And they had just written this film that he had directed. Year One. Well, I never went to see Year One, but people who did, including other Ghostbusters, said it was one of the worst things they had ever seen in their lives. So that dream just vaporized. That was gone. ^ Michals, Susan (October 5, 2010). "Dan Aykroyd Writing Ghostbusters 3 Script, Selling Vodka Out Of His RV". Vanity Fair. Retrieved April 29, 2012. I can tell you firsthand, I'm working on the script now and those two – Stupnitsky and Eisenberg, [writer-producers of The Office] – wrote Bill the comic role of a lifetime, and the new Ghostbusters and the old are all well represented in it ... we have a strong first draft that Harold [Ramis] and I will take back, and I'm very excited about working on it. ^ Plumb, Ali (February 3, 2012). "Dan Aykroyd On Ghostbusters 3 Rumours". Empire. Retrieved April 29, 2012. ^ Siegel, Tatiana; Kit, Borys (February 25, 2014). "'Ghostbusters III' Script to Be Reworked Following Harold Ramis' Death". The Hollywood Reporter. Retrieved September 3, 2014. ^ Fleming, Jr., Mike (March 18, 2014). "'Ghostbusters' A Go For Early 2015; Death Of Pal Harold Ramis Prompts Ivan Reitman To Turn Over Directing Reins". Deadline. Retrieved September 3, 2014. ^ Siegel, Tatiana; Kit, Borys (April 8, 2014). "Lord And Miller Off Ghostbusters 3?". Total Films. Retrieved April 8, 2014. ^ Sneider, Jeff (May 30, 2014). "Marvel's 'Ant-Man': Rawson Marshall Thurber Is Frontrunner to Direct (Exclusive)". The Wrap. Retrieved May 30, 2014. ^ Blume, Lesley (June 9, 2014). "The Making of Ghostbusters: How Dan Aykroyd, Harold Ramis, and 'The Murricane' Built 'The Perfect Comedy'". Vanity Fair. Retrieved June 9, 2014. ^ Kit, Borys (August 2, 2014). "'Ghostbusters 3' Targets Paul Feig as Director". The Hollywood Reporter. Retrieved August 2, 2014. ^ Whitney, Erin (September 17, 2014). "Dan Aykroyd Wants 'Ghostbusters' to Become Marvel-Style Universe". The Hollywood Reporter. Retrieved September 17, 2014. ^ Borys Kit (October 6, 2014). "'Ghostbusters' Reboot Lands 'The Heat' Writer Katie Dippold (Exclusive)". The Hollywood Reporter. Retrieved October 30, 2014. ^ Randee Dawn (October 14, 2016). "'Night at the Museum' star Rebel Wilson could be Ghostbusting soon: 'I'd do that for free'". Today.com. Retrieved March 10, 2017. ^ William Boot (December 12, 2014). "Shocking New Reveals From Sony Hack: J. Law, Pitt, Clooney, and Star Wars". The Daily Beast. Retrieved December 12, 2014. ^ William Boot (December 15, 2014). "Exclusive: Sony Emails Reveal Channing Tatum and Chris Pratt's Plans For 'Ghostbusters' Film". The Daily Beast. Retrieved December 15, 2014. ^ "Ghostbusters female line-up confirmed". BBC News. January 28, 2015. Retrieved March 10, 2017. ^ Barton, Steve Dan Aykroyd Insists His Ghostbusters 3 Is Coming, Dreadcentral.com; accessed March 9, 2017. ^ Miska, Brad (March 9, 2015). "Channing Tatum Starring In All-Male 'Ghostbusters'?!". Bloody Disgusting. Retrieved January 15, 2019. ^ Fleming, Jr, Mike (March 9, 2015). "Guy Theme 'Ghostbusters' Film With Russo Brother, Channing Tatum & IM3 Scribe Drew Pearce". Deadline. ^ Faraci, Devin (March 9, 2015). "Chris Pratt Could Join The GHOSTBUSTERS Expanded Universe". Badass Digest. ^ Barken, Jonathan (March 18, 2016). "The Russo Brothers 'Ghostbusters' is Confirmed Dead". Bloody Disgusting. ^ Osborn, Alex (July 17, 2016). "Other Ghostbusters Film With Chris Pratt and Channing Tatum Was 'Never Real,' According to Ivan Reitman". IGN.com. Retrieved August 2, 2016. ^ Breznican, Anthony (January 15, 2019). "Ghostbusters resurrected: Jason Reitman will direct a new film set in the original universe". Entertainment Weekly. ^ Nicole Riva (May 9, 2017). "ROM scientists name new dinosaur species after Ghostbusters villain". CBC News. Retrieved May 9, 2017. ^ Amina Khan (May 9, 2017). "Dinosaur named for 'Ghostbusters' creature found in Montana 75 million years after its death". Los Angeles Times. Retrieved May 9, 2017. Austin, Bruce A. (1989). "Which Show to See?". Immediate Seating: A Look at Movie Audiences. Wadsworth Publishing. ISBN 0-534-09366-3. Browne, Ray Broadus; Browne, Pat (2001). The Guide to United States Popular Culture. Popular Press. ISBN 9780879728212. Shay, Don (1985). Making Ghostbusters: the Screenplay. New York: New York Zoetrope. ISBN 9780918432681. Wallace, Daniel (2015). Ghostbusters: The Ultimate Visual History. San Rafael, California: Insight Editions. ISBN 9781608875108.